I found HVMN a long time ago when I was researching nootropic products. For those of you who don’t know, nootropics are a class of product that is designed to give you enhanced cognitive abilities. That could be in memory, or learning, or focus, or just feeling more energized. But the long story short is that this company used to be called something else. They made vitamins and had some venture funding. They are a San Francisco brand and I thought they were always kind of ‘cool’. They still sell those pills/vitamin products, but they also now have a new feature products called ‘HVMN Ketone’. *$99 for a three-pack. More on that later. HVMN does have some light, fruity flavors. It is slightly sweet, but not overly so. I would not want to drink an entire glass of HVMN Ketone, but I did expect the taste to be much, much worse. I myself still don’t FULLY comprehend the full extent of how ketones work in the body, but I will try to share with you some details of what I do know. Ketones are the result of the body processing and using stored bodyfat for fuel. While we understand that the body uses three different substrates for fuel (carbs, proteins, and fats), the ketone deals with fat as energy. Ketone proponents argue that fat is actually the bodies favorite source of energy. That it can have physical and mental benefits that the other two sources do not. Of these four products, none of them use the same ingredient as HVMN. HVMN uses a Ketogenic BHB ester called ‘D-betahydroxybutyrate Ester’. This material is supposed to be superior to BHB salts, which is what most other KETO products use. Actually some of the other products will use coconut material to tease out the ketosis-stimulating materials. So coconut oils, butters, etc. So what else. 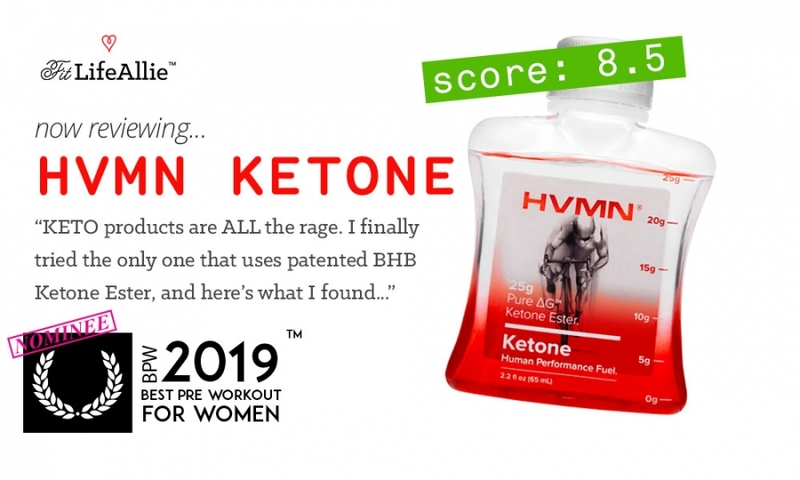 This HVMN Ketone product is literally just that special BHB ester material. Unlike the more traditional ‘pre workouts’ that I have used and reviewed in the past, this product actually contains just the one ingredient. Easier for me to explain! After taking my three ‘shots’ of the HVMN ketone, I actually can tell you which of these effects are for real and which are marketing speak. The most important thing to me was really in terms of the mental / cognitive improvements of keto. I, like many of us, am a caffeine ADDICT who truly could benefit from a new approach to increasing my energy levels- particularly in the morning. So I went into my experience with HVMN hoping that this product would be the holy grail that would have me leaping from my bed with a smile on my face. That was not the case. HA! But here’s the thing- HVMN Ketones actually DO help give me energy, but just not the type that we had when we were young (hey that’s a great song- ‘when we werrrrrre younggg’ by the Killers, right? LOL where’s my ‘00s rock fam at!) Okay but yeah I did take my three HVMN pouches on consecutive days and I found that about a half hour after taking the Ketones, my mental clarity was actually pretty good. I felt focused, and like I was capable. I don’t really believe that the HVMN ketones were instantly creating a ketogenic state within me, but I DO think that they were providing an instantaneous, and highly efficient energy source for me to use. The other thing that I noticed when talking HVMN ketone was that for whatever reason I was less anxious than I usually am in the morning. I think that the difference between caffeine and ketones are the reason. Caffeine is a stimulant and can elevate your cortisol and adrenaline. Ketones raise energy not by impacting your hormones but by providing a source of fuel- like gasoline in your car. So that was super promising. But what about exercise? Now keep in mind- I no longer do crazy long high-intensity workouts. I get in and I get out. (That’s what he said). No literally that perfectly describes my ex boyfriend I HATE HIM SO MUCH LOL. Ugh. I’m losing it. I did try HVMN Ketone for my short HIIT workout though. I took it right at the beginning to see how it functions as a pre workout. So if you are curious ‘is HVMN a good pre workout’ solution, the answer is, well, kind of. It wasn’t clear. You should not expect the kinds of feelings that you get from a full-blown fully-caffeinated pre workout. But at the same time, there ARE some results and effects of ketone during exercise. I did feel like I could go a LITTLE bit longer and harder due to the ketone. I didn’t necessarily feel like my max strength increased like it does with a creatine or betaine-powered supplement, but I really did feel like I had a small increase in endurance. So that is something to pay attention to. Let’s look at some finer details of HVMN before we conclude. So the name HVMN is odd and apparently it stands for ‘human’ (I watched a promo video of the founders discussing what it means and when they pronounced it as ‘human’ I thought it was so weird lol. Even though I think the name is a little confusing I do like the branding of this new company. It is somewhere between a ‘tech company’ vibe and a bio-tech vibe and a supplement vibe. The company also sells some pills and things that are much more traditionally recognizable as vitamins such as sleeping vitamins and morning daily vitamins. These products share some of the sharp branding as the HVMN Ketones. What I like most about the HVMN products from an appearance standpoint is just how they LOOK. They use a really nice red color that pops, and a bold, wide font. The branding just looks sturdy and functional. It’s really a nice job on packaging and branding because it invokes the emotions that you want when dealing with sports products- bold and effective. Okay. Let’s wrap this thing up.